As every year, the first day of the Perfumes & Cosmetics congress, which was held in Chartres on November 14 and 15, 2018, ended with the intervention of the control authorities. 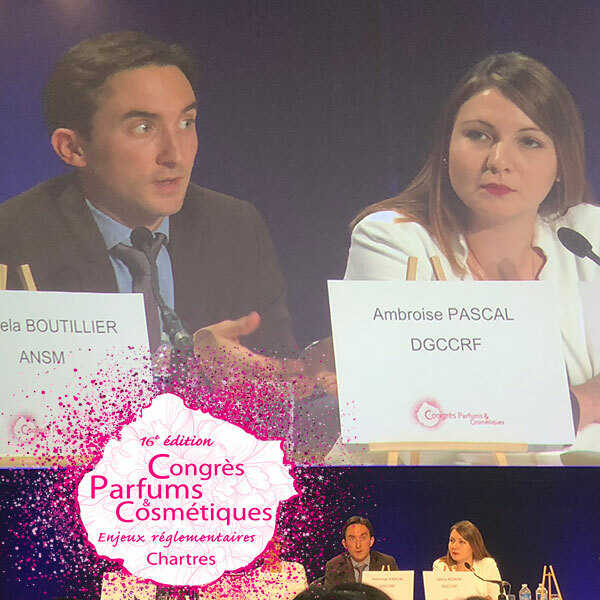 The DGCCRF, represented by Ambroise Pascal, Head of the Bureau of Health Products and Human Services and Céline Nowak, Editor in charge of Cosmetics, reported on the results of their inspections in 2017 and 2018. Before discussing the controls carried out by its services, Ambroise Pascal recalled the missions of the DGCCRF. The French General Directorate for Competition, Consumer Affairs and Fraud Control is attached to the Ministry of the Economy. It has several objectives. It is carried out according to several criteria. First of all, it is based on complaints, reports and alerts that may come from consumers, but also from professionals. “It is our responsibility to take into account all the signals, strong and weak, that reach us,” commented Ambroise Pascal. In addition, there are programmed controls that respond to a qualitative and knowledge-based approach to developments in the sector, “such as the CPMMs (First-to-market controls), which aim to deepen all the organisations and structures that ultimately make it possible to have compliant products and to make consumers safer. We also monitor cosmetics sold on the Internet. Every year, we carry out nearly 12,000 controls as part of online sales,” he added. These various controls are an opportunity to identify particular points of vigilance: the non-implementation of regulations and recurrent bad practices.